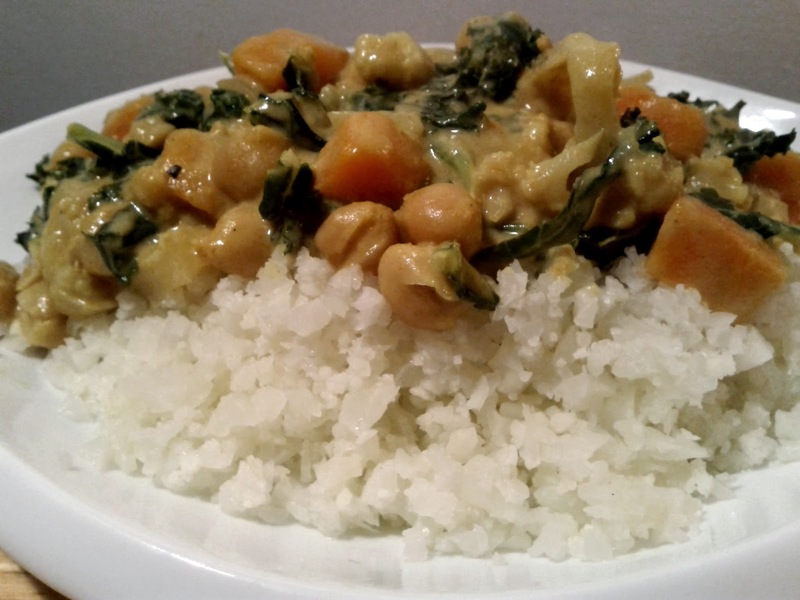 This coconut curry was delicious! It was the first time I added sweet potato to a curry and I think it turned out very well. By getting some of the sweetness from the onion and sweet potato, I found I had to add less sugar to the curry itself (as I like mine a little sweet pared with the coconut). The cauliflower rice was an idea I got from Jamie Oliver. 1. Start by prepping all your ingredients by chopping the sweet potato into chunks, dicing the onion, slicing the kale into thing strips, and opening your cans of chickpeas and coconut. 2. Begin cooking by frying your onions in some kind of flavourless oil until they are translucent. You can then add in your spices and garlic. Cook them for a 1-2 minutes to reinvigorate them. 3. Toss in your sweet potato, chickpeas and cauliflower as they will take longer to cook than the kale. Then add in your coconut milk (including most of the liquid if you want it a little soupy, if not try to use most of just the creamy parts) and any spices you haven't already added. 4. At this point things will need to cook for a while. Maybe 10-15 minutes. But this is the most important part because you need to taste the sauce of your curry. You want to find a nice balance. It needs enough salt, sweetness, and heat to really work. 5. After the sauce is tasting good and it has cooked down a bit and your vegetables are cooked through. Add in your kale. This should cook through in a few minutes. 6. Serve with rice or quinoa. Or you can blend some cauliflower in a food process until its the shape of rice. Steam it. And perhaps lightly salt it with a fine salt.